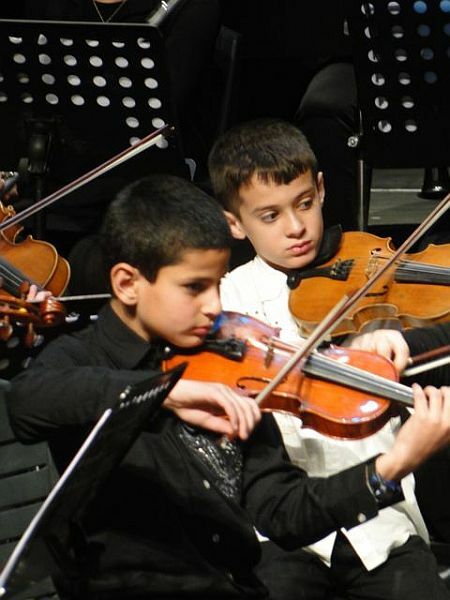 The journalist Sandy Tolan—presently based in Ramallah and with a new blog, Ramallah Café—has two posts here and here on the Al Kamandjati orchestra, which is made up of young Palestinians from across the West Bank. 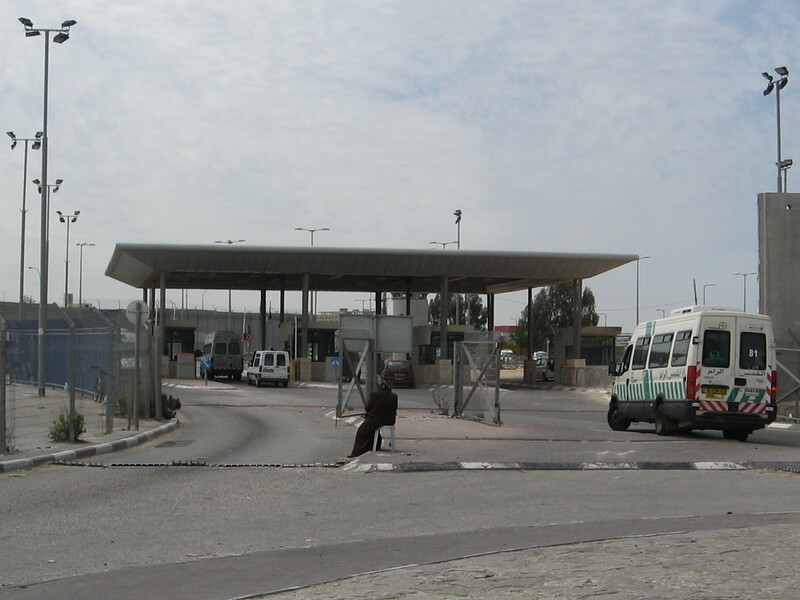 This past week the orchestra, “armed with violins, cellos, woodwinds and brass,” held a concert at the Qalandia checkpoint, bringing smiles to the faces of the bemused Israeli soldiers. 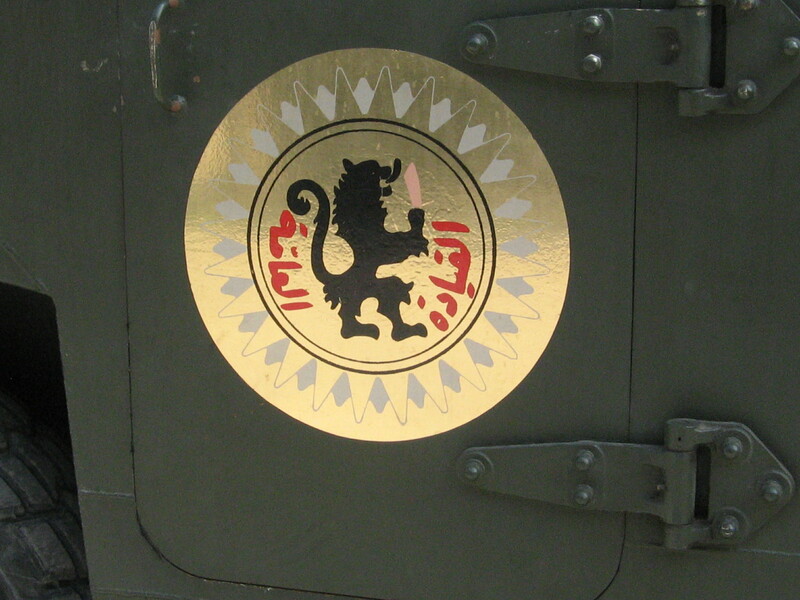 It won’t advance the “peace process” one millimeter but was a nice initiative nonetheless. 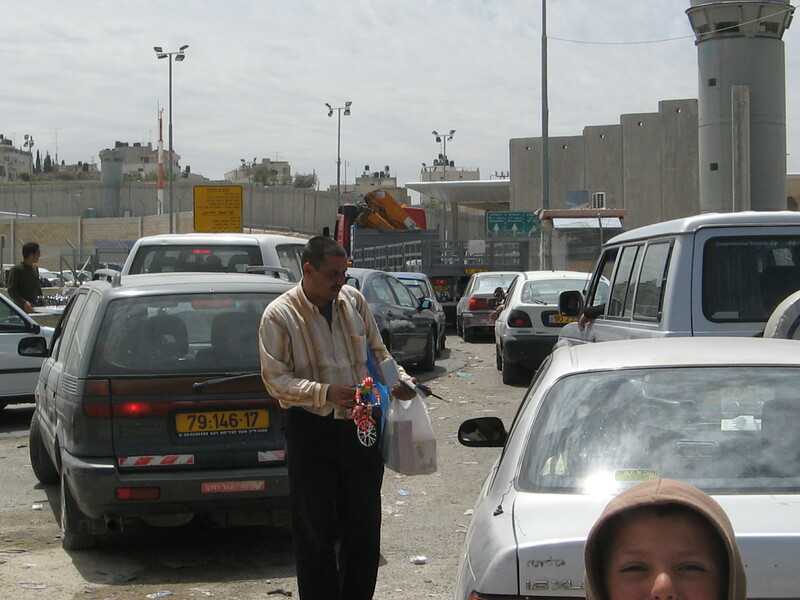 I went through the Qalandia checkpoint some three dozen times during my visit to Israel-Palestine two years ago. Here are some photos I took of it. No. 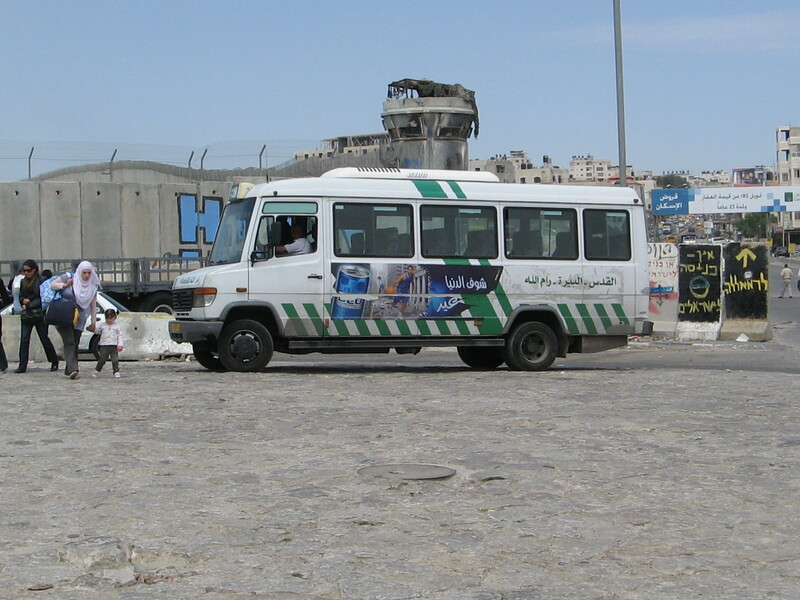 18 bus: Jerusalem (Nablus Road)-Ramallah. Best way to go. Takes 5 to 45 minutes to get through this, depending on the time of day (and the mood of the 19-year old soldiers checking your papers). 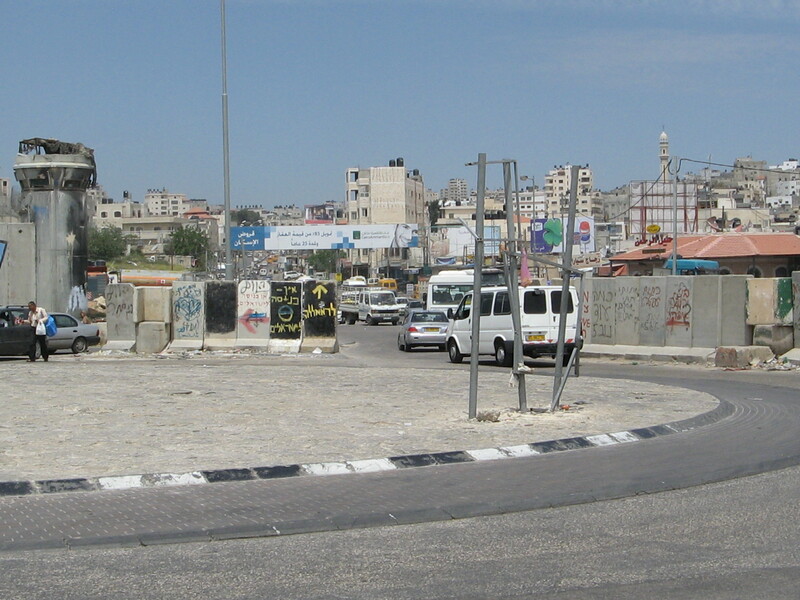 The wall running from the checkpoint. Looks like internationals had a hand in some of the graffiti. It’s safe to guess that you are not booking travel right now to the Middle East or North Africa. Your eyeballs are probably exploding from scenes of riot, devastation, repression, shooting, looting, murder, mayhem and burning. You’d much rather frolic on a beach, sample new foods, swim, sun, sleep and pursue your own personal peace. Right? 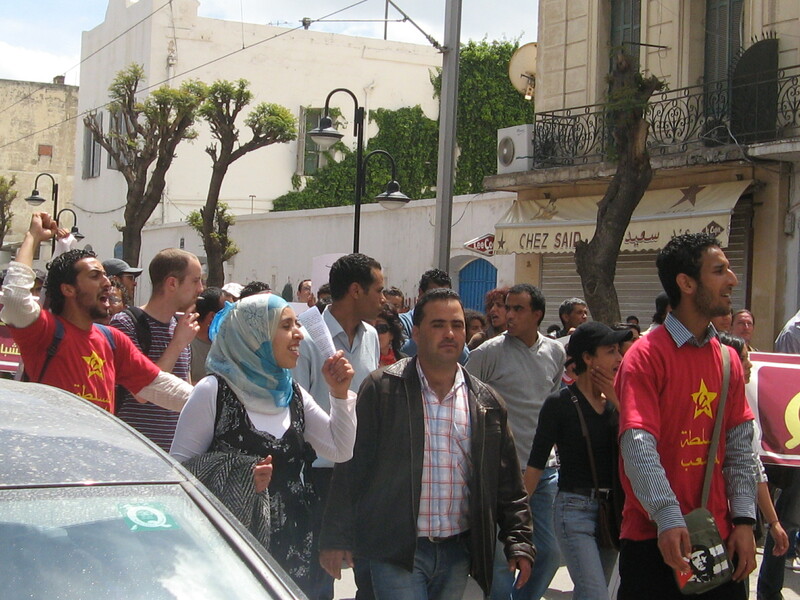 About a month ago, my husband Paul and I were en route to Tunisia, which was largely calm and peaceful, to see what the revolution was like on the ground. In my experience, there is media, and then there is reality. Reality, for me, means traveling around the country, meeting a lot of people, listening to what they have to say, asking questions, and trying to get below the surface. 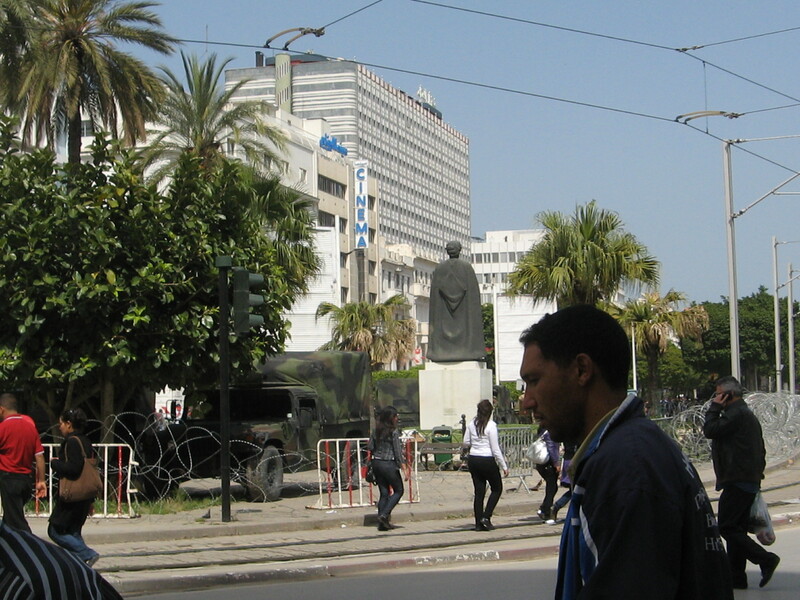 We were just about to board a Tunis Air flight when I got a frantic email telling me that riots had broken out in Tunis, the main avenue where we had booked a hotel room was shut down under military guard, and we would have no access to our hotel. I took a deep breath, walked onto the plane, and, when the door had closed behind me, I calmly put my seat in the upright position, made sure my tray table was properly stored, and then felt a surge of panic. 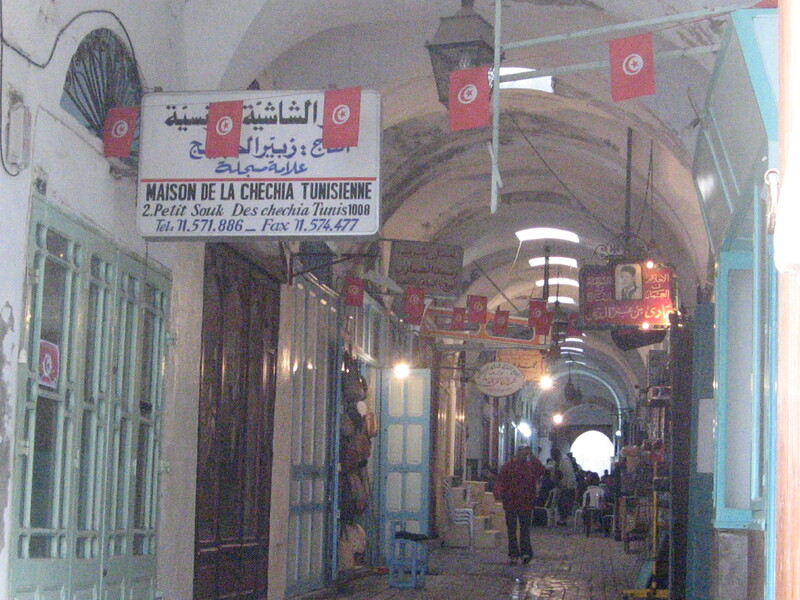 It was nighttime and we had nowhere to go once we reached Tunisia. What happened then was extraordinary. 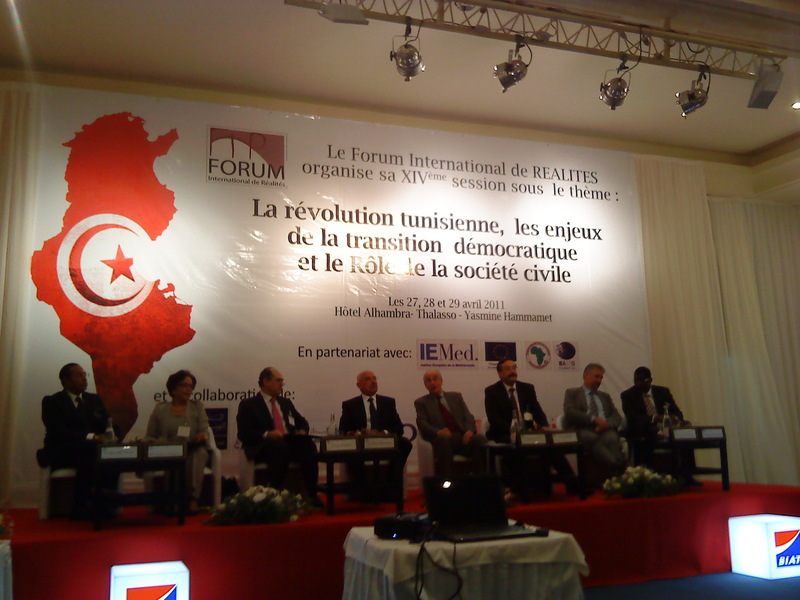 She goes on to describe the marvelous time they had in Tunisia and the generosity and kindness of the Tunisian people. Read the whole thing, particularly if you have any thought of visiting the country. 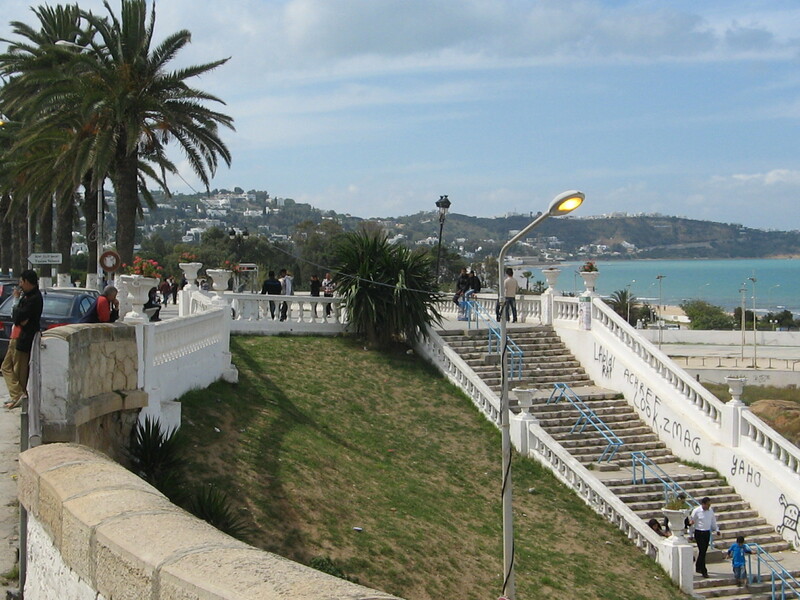 Tunisia is suffering economically with the collapse of tourism—on which its economy so heavily depends—since the January revolution. But there is no reason whatever for foreigners to be avoiding the place. 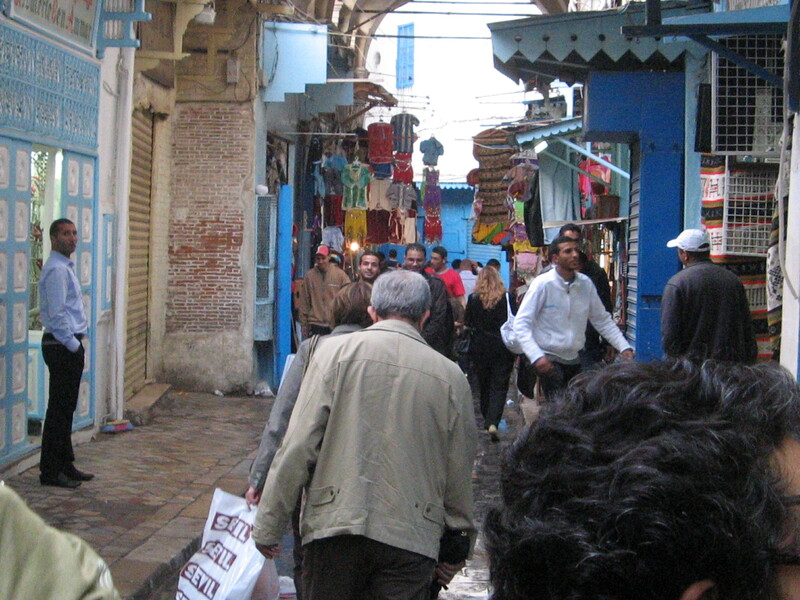 Fein’s story made me think of a Polish couple in their mid-late 20s I met on the Tunis tramway in May, who happened to be sitting in front of me. They were hippie-ish in their dress and appearance, which is not too common there, spoke neither French nor Arabic, knew nothing about that part of the world before arriving there two weeks earlier, and didn’t know what to expect. They gushed about what a great time they had had and how nice people were, of the number of homes they had been invited in to while traveling in the interior of the country. 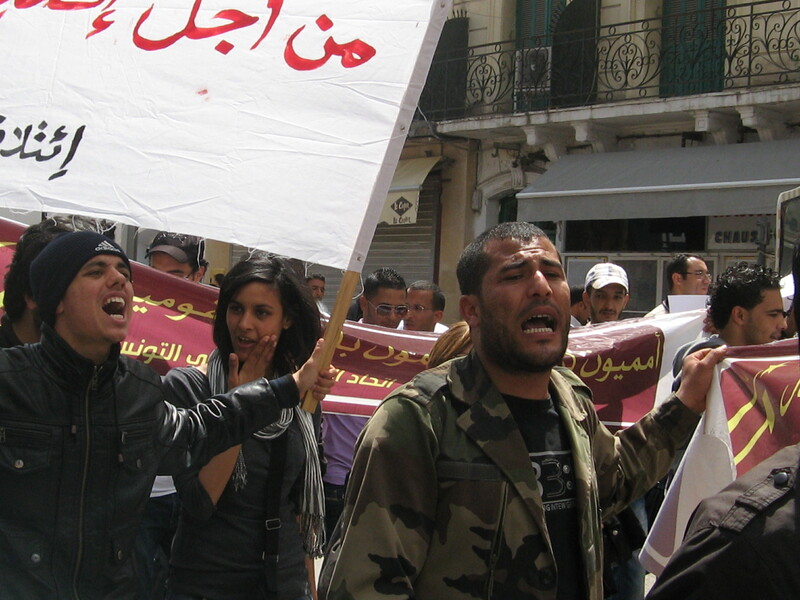 These stories are not out of the ordinary, either in Tunisia or elsewhere in the Arab world. 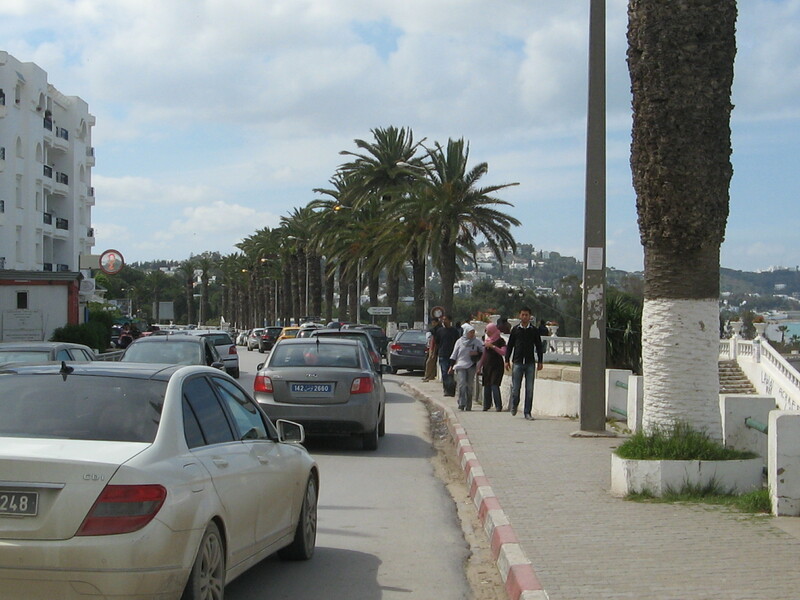 On the subject of revolutionary travel, here are some photos I took of the “revolutionary” side of things during my trip to Tunisia in late April-early May. 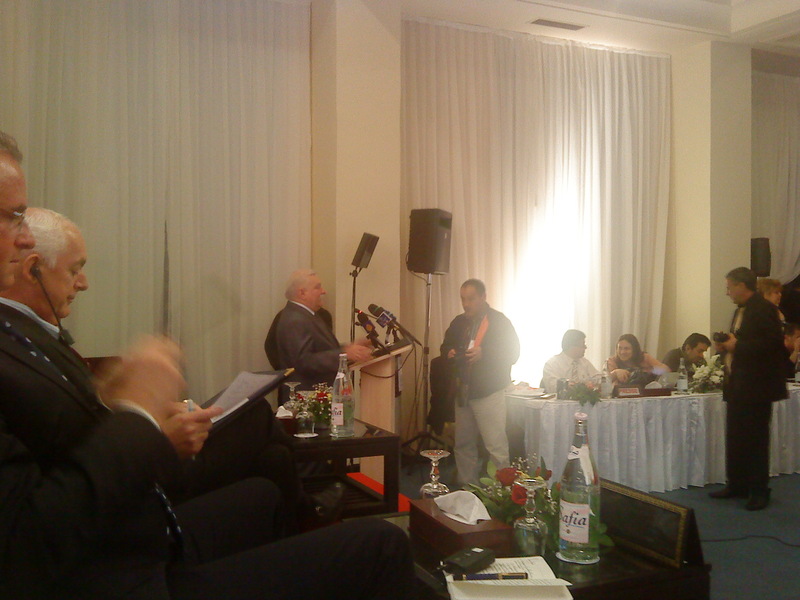 This one is of the two-day conference I attended in Yasmine Hammamet, that I posted on at the time. The freedom of tone was total. No one hesitated to say what was on his or her mind, or had the slighest fear that there could be mukhabarat agents in the room. 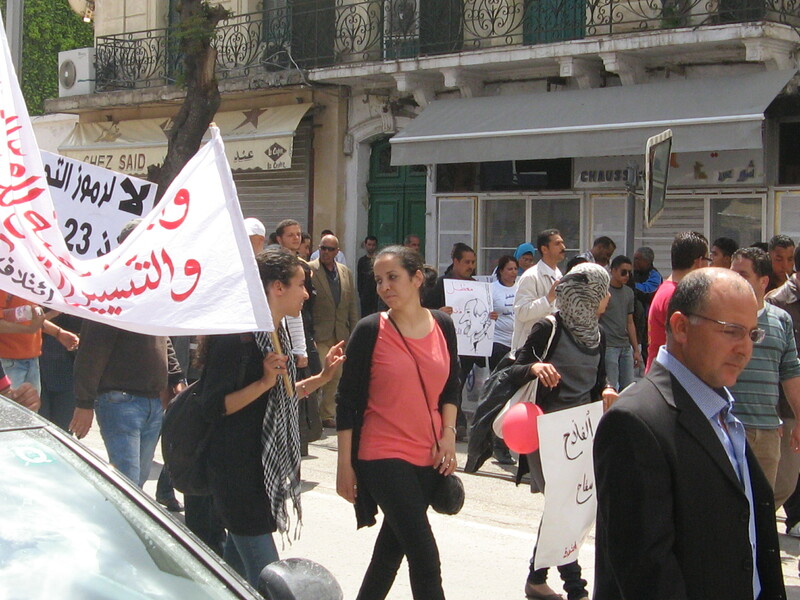 Given what Tunisia had been prior to January 14th, this was quite extraordinary. And then there was this keynote speaker, whom I also posted on during the event. 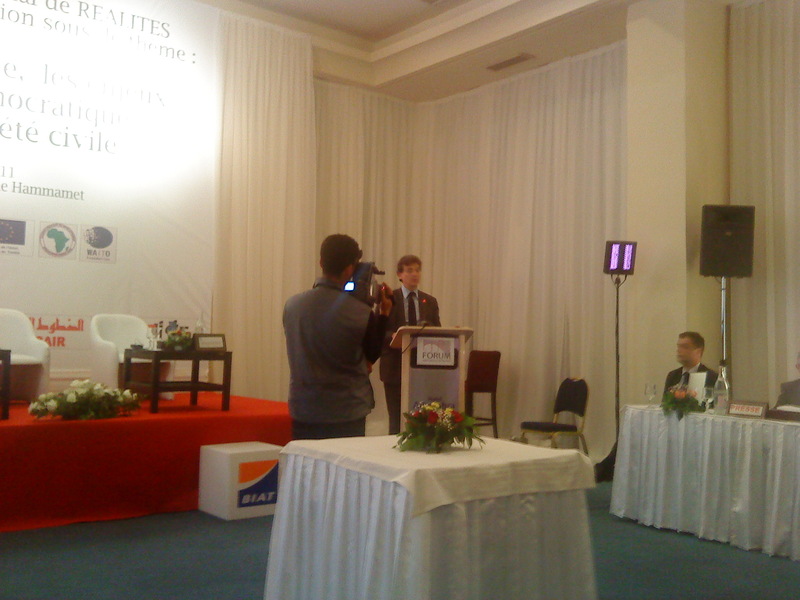 Arnaud Montebourg was another keynoter (he told me he liked my talk, BTW…). 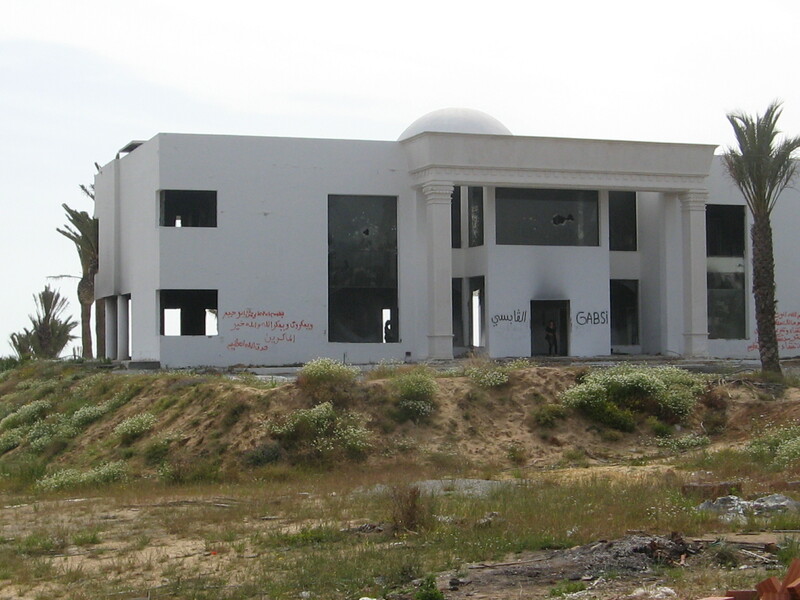 Here’s a trashed villa in Hammamet, which had been inhabited by a member of the Trabelsi family. 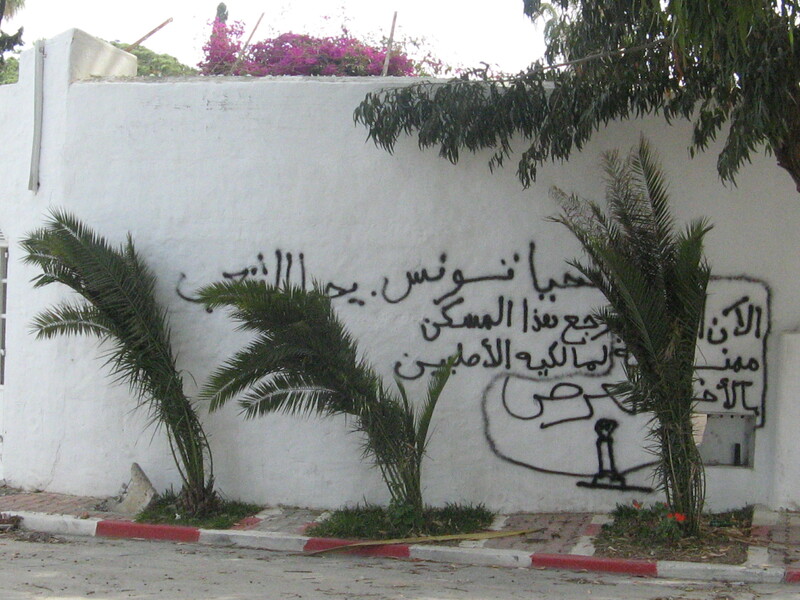 And political graffiti on the villa’s wall. 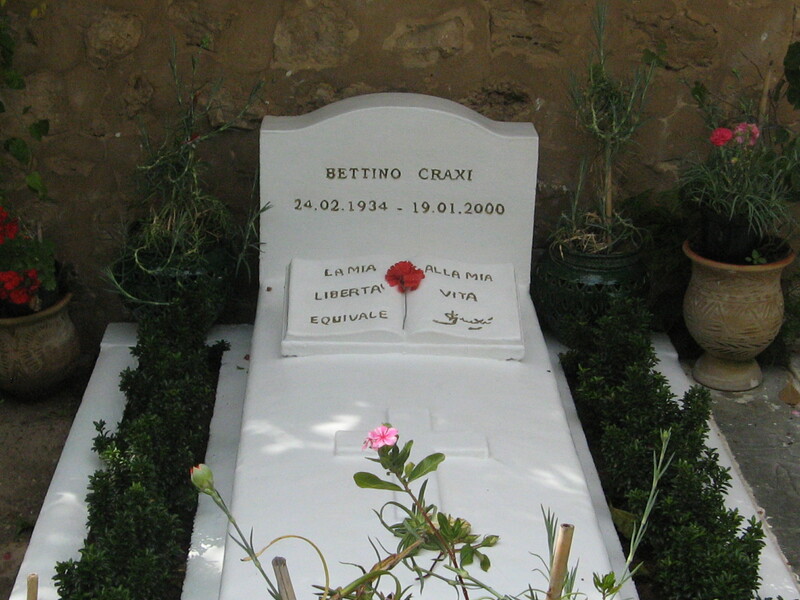 The Hammamet cemetery. Not related to current political events but political nonetheless (and of interest to Italians). 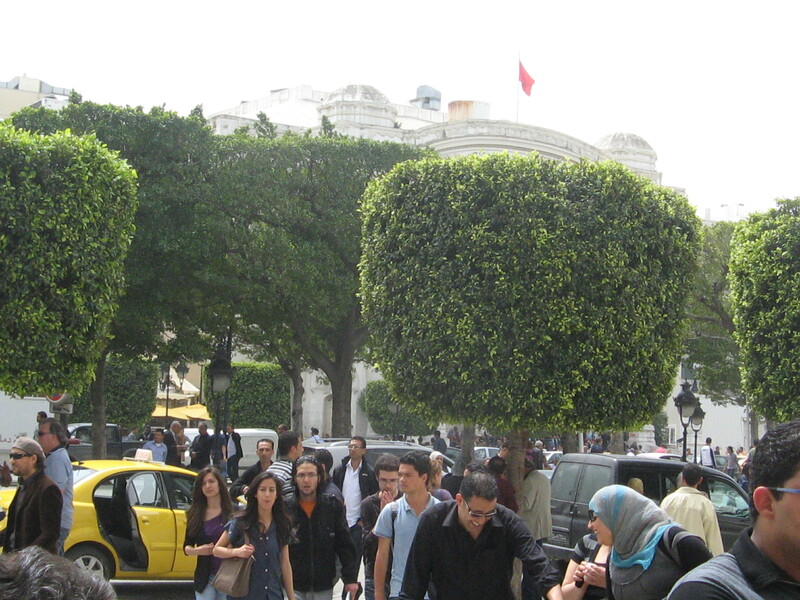 This is Avenue de Paris in downtown Tunis. 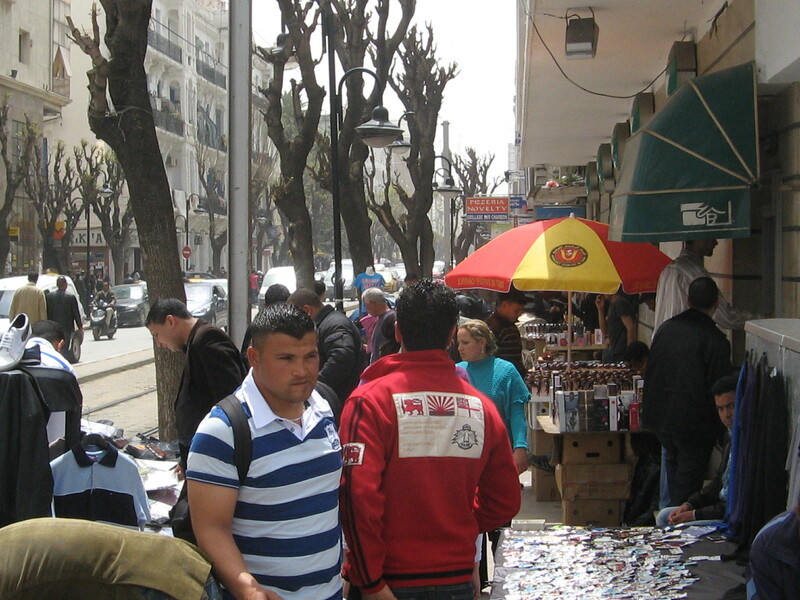 The sidewalks in the city center are lined with hawkers and peddlers (marchands ambulants), which was impossible before January 14th, when they would have been immediately chased away by the police. This is one of the downsides of the revolution: the relative absence of the state and decline of public order. 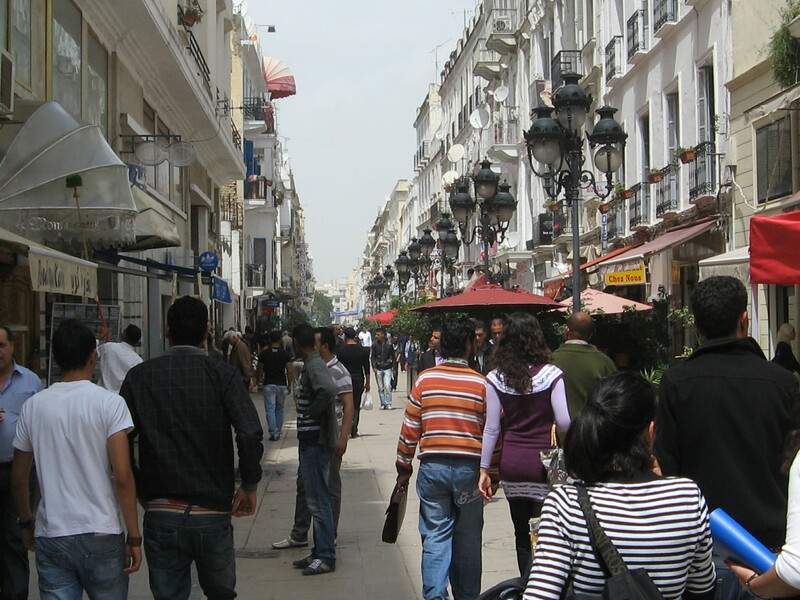 Downtown Tunis now looks like Barbès in Paris. And the plethora of hawkers is a sign of high unemployment and the desperate condition of a part of the population. 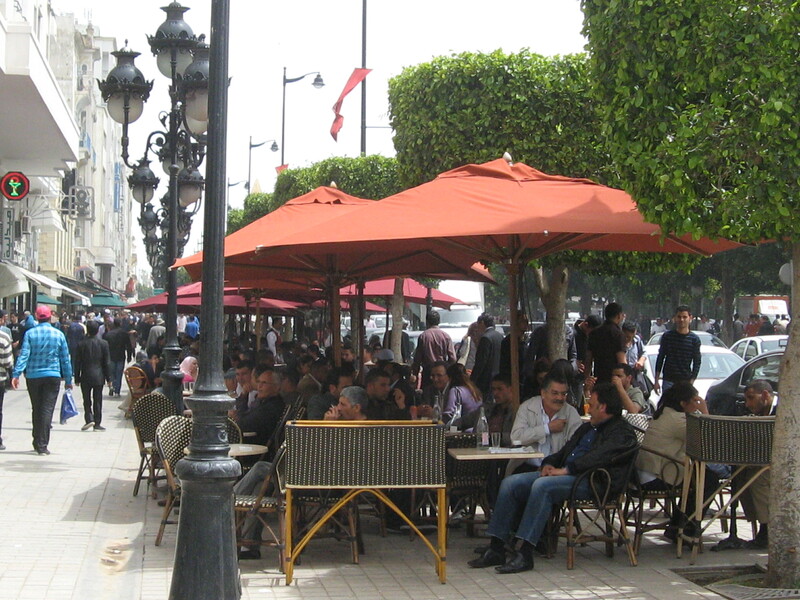 Avenue Habib Bourguiba in midday. 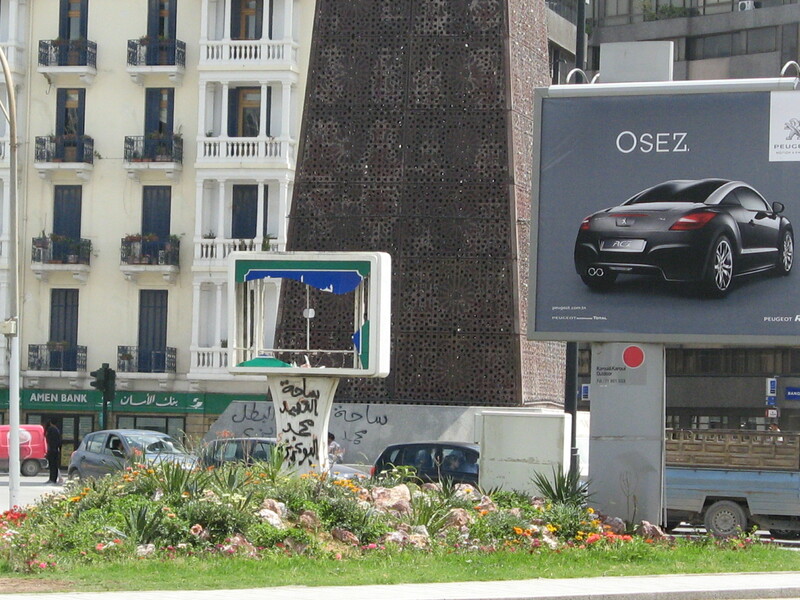 Rue de Marseille, just off Bourguiba. 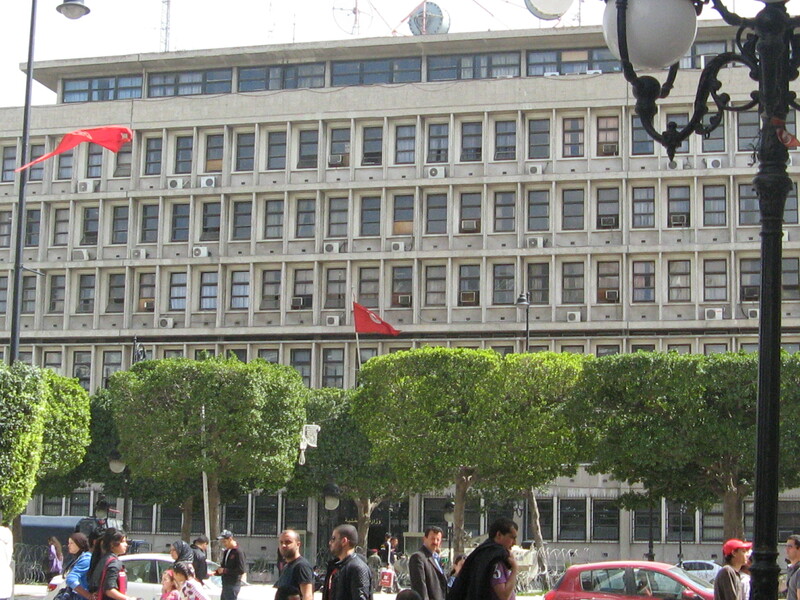 The Ministry of Interior, on Avenue Bourguiba. The mere idea of taking photos of this was inconceivable before January 14th. One would have been arrested within 15 seconds, taken into detention, and with camera confiscated bien entendu. This time, after a minute or two, a soldier wagged his finger at me from a distance, indicating that photos were not allowed and that I should continue on my merry way. 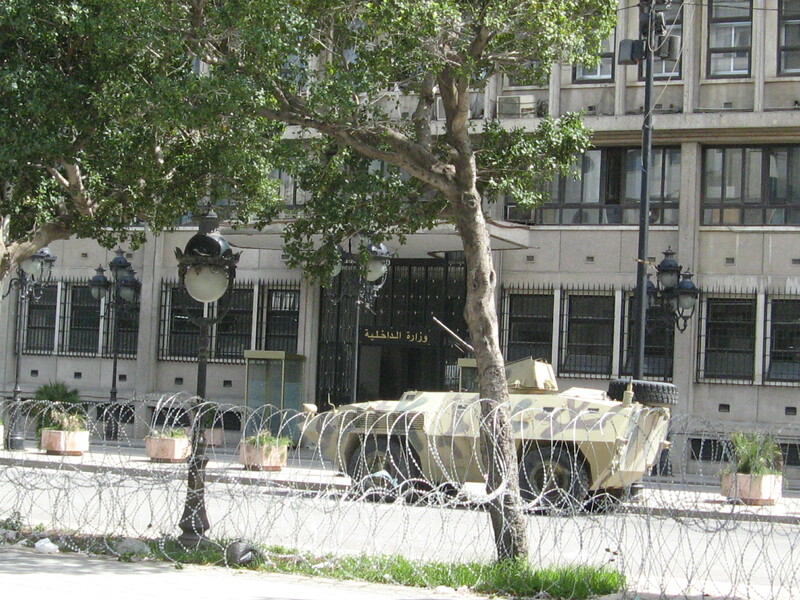 There are military vehicles in the middle of the boulevard. Passers-by stop and chat with the soldiers. And one can take close-up photos of the vehicles. Try doing that in Algeria or Syria. Hah! 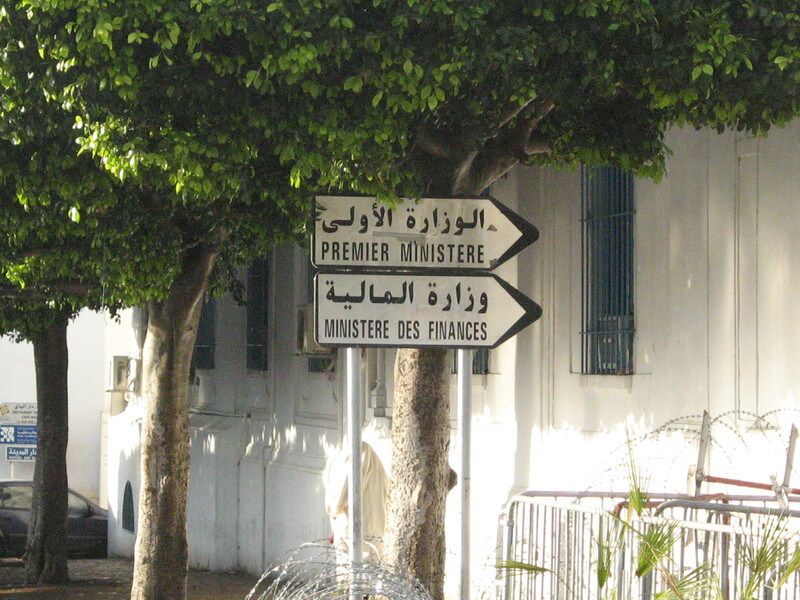 At the eastern end of Avenue Bourguiba, the ex-Place du 7 novembre 1987 (date of Ben Ali’s seizure of power)—all indications effaced—, now renamed the Place du 14 janvier 2011. The HQ of the now banned RCD, empty and guarded by soldiers. 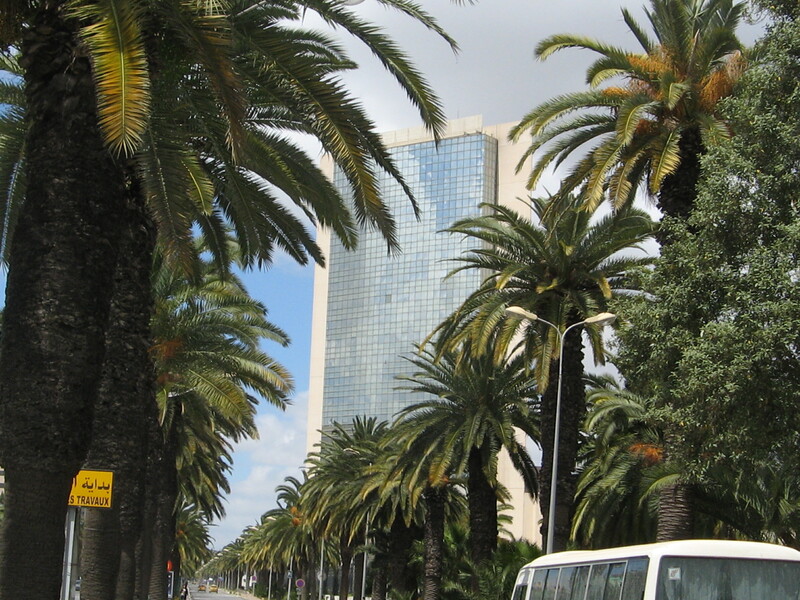 Is the tallest building in central Tunis. 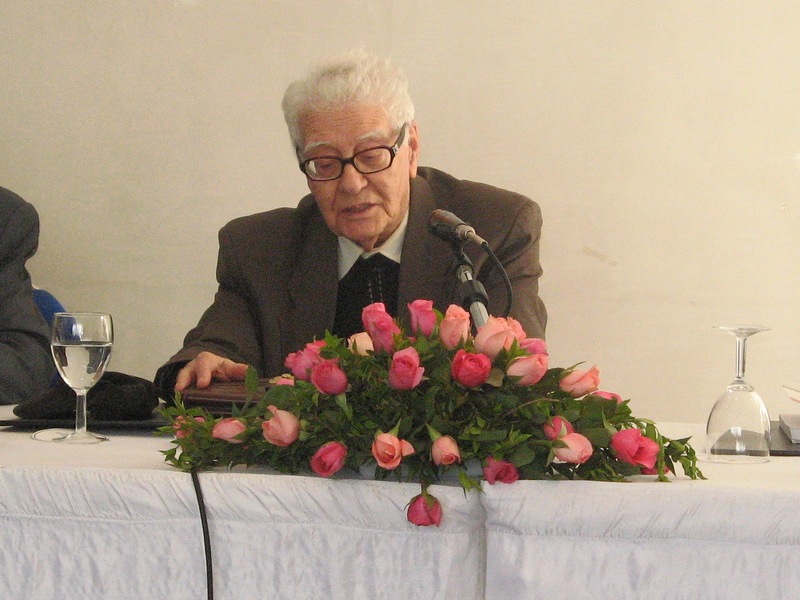 A talk by Ahmed Ben Salah before a small group of political activists. He’s 85-years old but can go on for hours—about the past, of course—and without skipping a beat (we left after two and he was nowhere near finished). 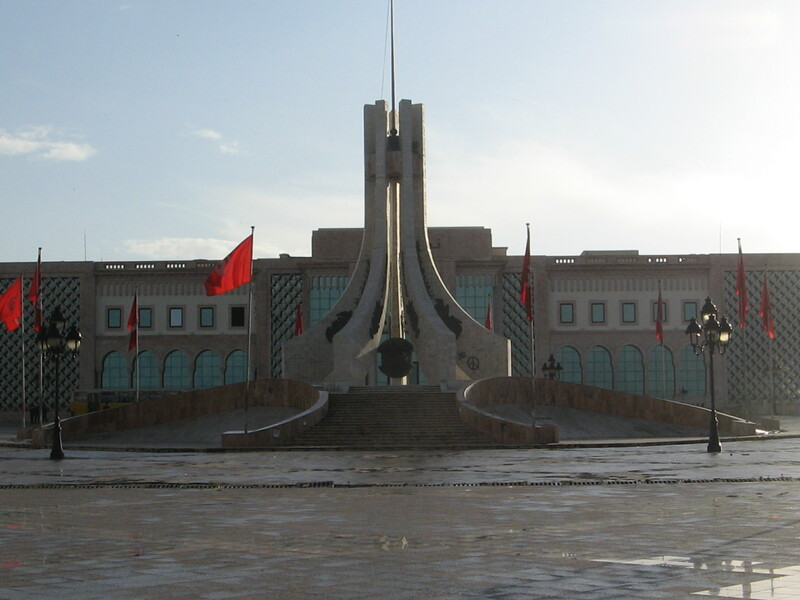 The Place de la Kasbah, where large rallies and sit-ins have been held. The police have now blocked off the main entrance into the Medina and with barbed wire. 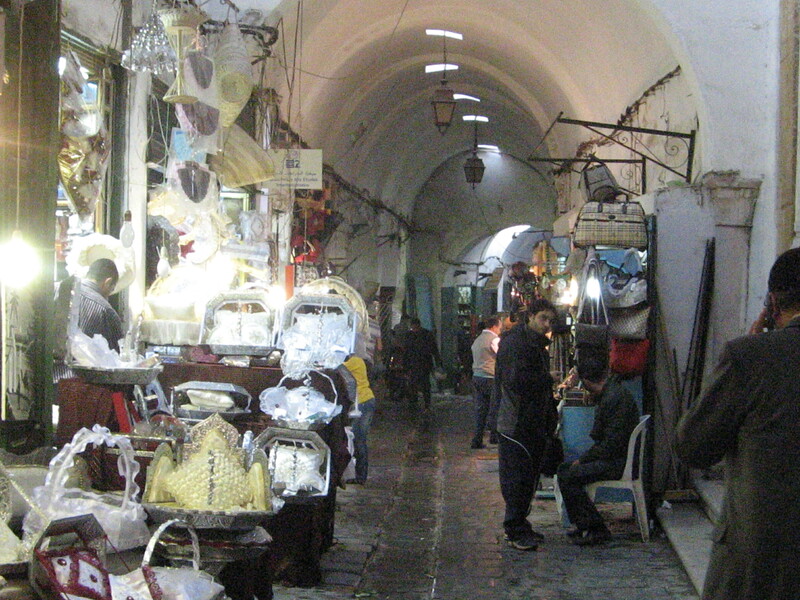 Merchants in the Medina are hurting. Business is not good. 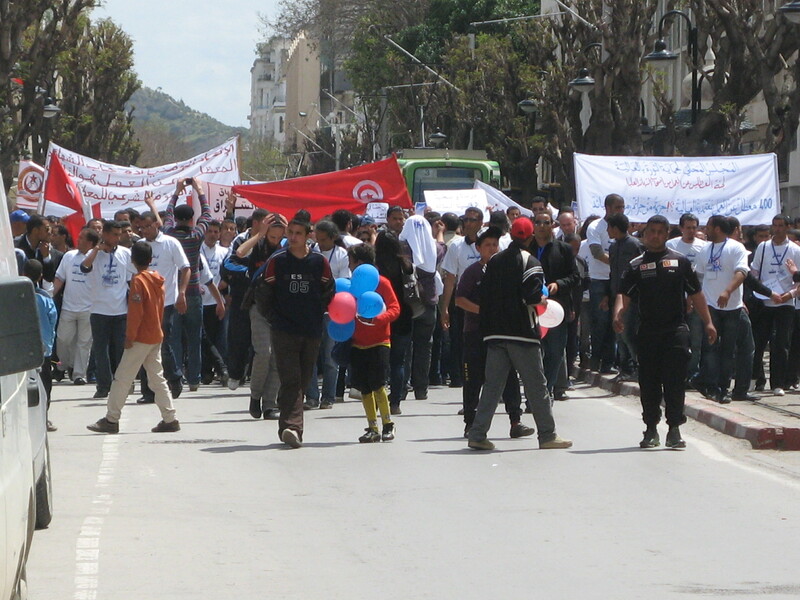 Back in downtown Tunis on Sunday morning we stumbled across this demo, by an association of diplômés-chomeurs (unemployed university graduates). 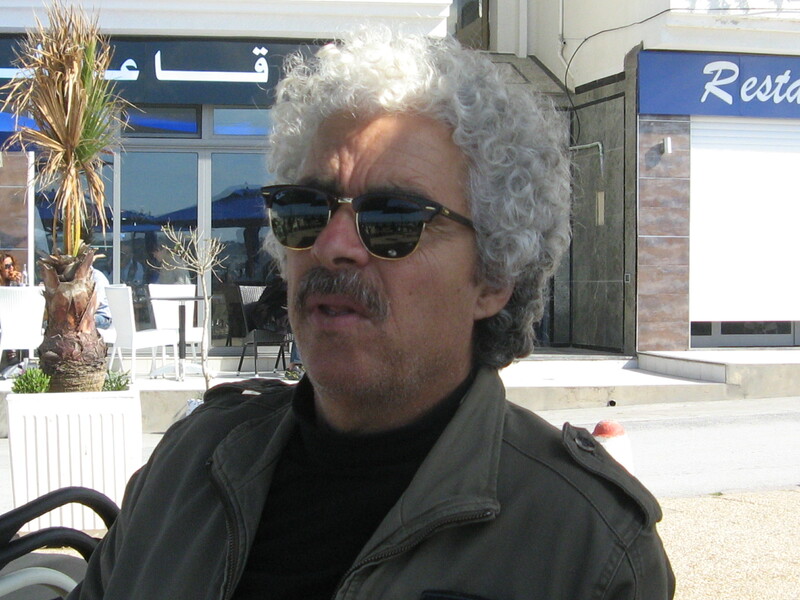 …in the most interesting company of this well-known film maker and playwright, and a founding member of the new civic association L’Initiative citoyenne. 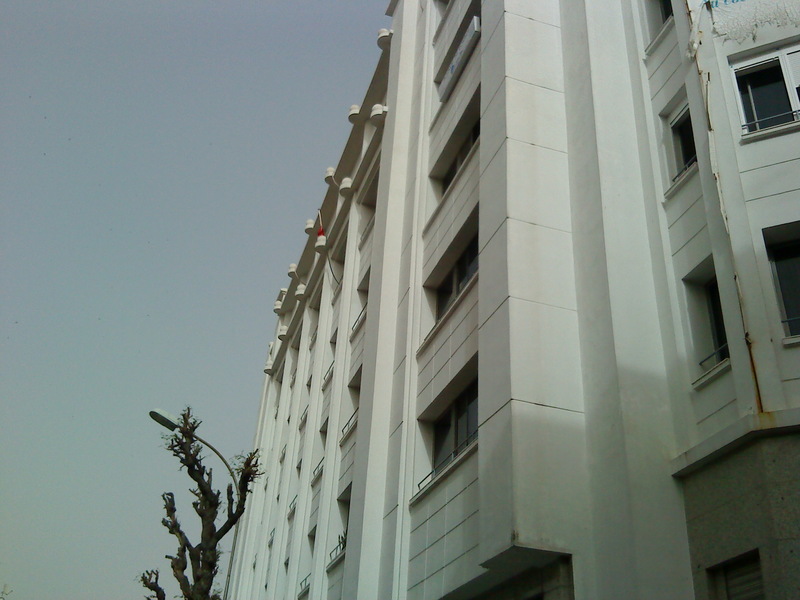 Finally, the spanking new HQ of Ennahda, in downtown Tunis, on the corner of Rue d’Angleterre & Rue El Jazira. Don’t worry, they don’t take up the whole building. Just a floor or two. 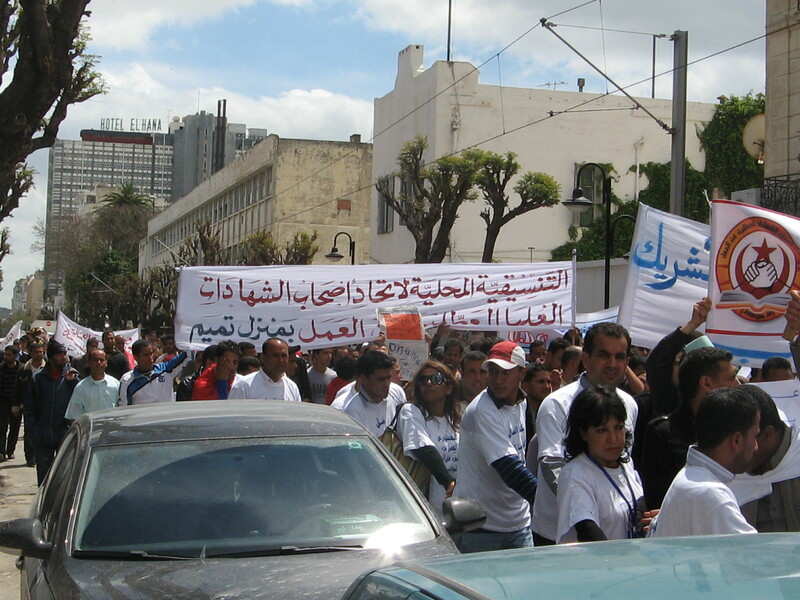 Is Ennahda the future of Tunisia? Let’s hope not. Well, this is interesting. 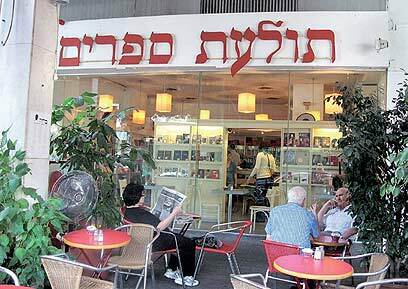 The trendy gauchiste Slovenian philosopher Slavoj Žižek gave a talk at a hip Tel Aviv bookstore last week, which was packed with lefty pro-BDS types. They seemed disappointed, according to the webzine +972, as Žižek did not tell them what they were no doubt expecting to hear. I’ve read several articles by Žižek. I alternatively find him interesting, obscure, off-the-wall, or incomprehensible. He sounded relatively lucid here. 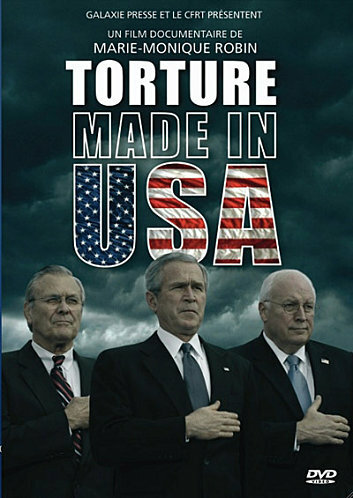 ARTE broadcast an excellent 85-minute documentary last week on torture in the USA, by the journalist and filmmaker Marie-Monique Robin. It is no longer available for viewing on the ARTE web site but may be seen on YouTube (in 9 parts) [UPDATE: and here]. An America in which torture becomes an acceptable, even normal, practice is not the America I know. It is not an America that I would want to know. Back to Marie-Monique Robin, she authored an exceptional book in 2004, Escadrons de la mort, l’école française—Death Squads, the French School—, on how French military officers—all veterans of the Algerian war—trained Latin American dictatorships of the 1970s and ’80s—notably Argentina and Chile—in torture techniques. The book has not been translated into English but does exist in Spanish. It was also made into a documentary, which may be seen on YouTube (in 7 parts) [UPDATE: and here and here (with Spanish subtitles)]. The Guardian’s Jason Burke has an inquiry on the ongoing outrage of the treatment of foreign domestic workers—mainly from the Philippines, Indonesia, Sri Lanka, and Ethiopia—in Saudi Arabia. Also in the Gulf States, Lebanon, Jordan, and elsewhere in the region. It’s near slavery. Much has been written on the subject, including by humans rights NGOs, but it’s not enough. A real international campaign needs to be launched. I wrote earlier today about the conference I attended on Tony Judt. Last week I also attended part of a two-day conference entitled “Retour sur les révoltes dans le monde arabe,” at the office of the intellectual journal Esprit. It was more of a round-table, in fact, with some 20-25 in attendance. Like the CERI-Tony Judt conference, the collective brain power at this one was very high. It always is at Esprit events. It’s French intellectualism at its best. People are just very smart, erudite, and well-spoken. And the political orientation and general world-view of Esprit and friends of the journal conform almost perfectly to my own. The conference speakers—among them the always interesting never boring Olivier Roy—were very good but there was one in particular who stood out: Abdelwahab Meddeb. First time I’d ever seen him in person. 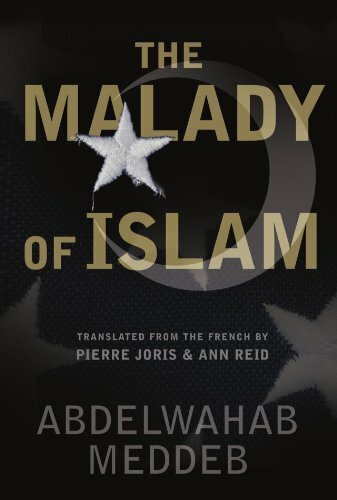 Listening to him talk, it was one of those times when I say to myself “this person is quite simply brilliant.” His erudition on Islamic thought, past and present, plus his analyses and commentary of what’s happening today in Tunisia, Morocco, Egypt, and elsewhere in the region, are simply on another level. I’ve never read his books but will find the time to do so. I attended most of this very good conference—organized by the CERI and New York Review of Books—yesterday and the day before, commemorating the life and work of Tony Judt a year after his death. Though it was in Paris there appeared to be more New Yorkers than Parisians in the audience, a number of whom looked to be NYRB authors. The collective brain power in the room was exceptional. The discussion on the future of social democracy was most interesting, notably Pierre Rosanvallon’s excellent talk on the subject. This prompted me to reread Tony Judt’s brilliant lecture—lots of superlatives here—from October 2009, “What Is Living and What Is Dead in Social Democracy?” It’s a must, if one missed it back then. 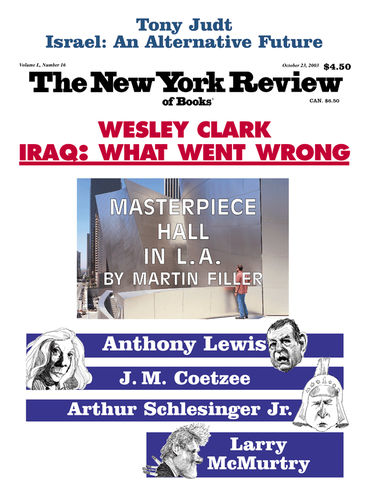 Tony Judt’s essay, “Israel: The Alternative” [NYR, Oct. 23], is provocative and brave – one can imagine the hate mail and death threats he’s sure to receive – and will hopefully provoke considered responses from American supporters of Israel. I entirely agree with Judt on everything, except on three points. First, he exaggerates in labeling Israel an anachronism. 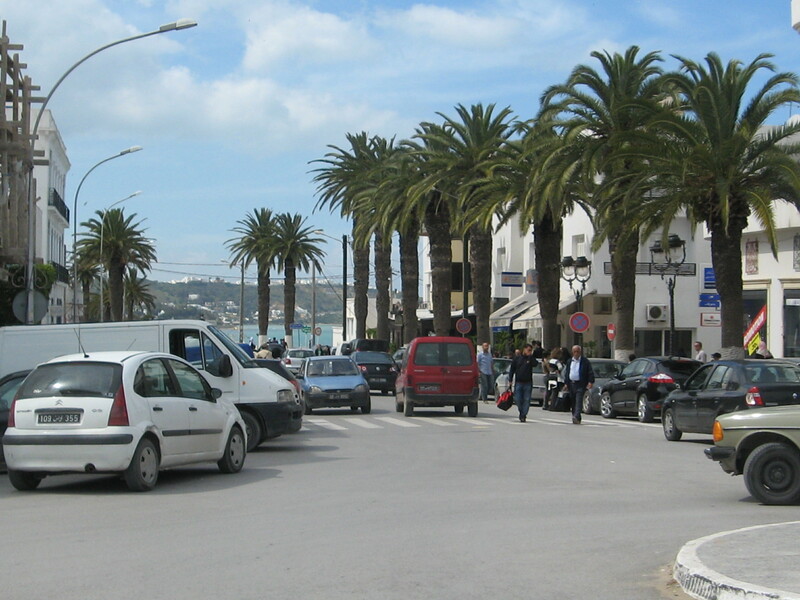 The Zionist conception of the nation is clearly exclusionary in a way that, e.g., French and American conceptions are not (though French universality was incapable of integrating Algeria – and has ongoing troubles with Corsica – and it is not certain that the US would remain one nation, indivisible, were Puerto Rico to become the 51st state). But I don’t see how the notion of a Jewish nation is fundamentally different from, say, that of a German, Greek, or Japanese nation – such as the Germans, Greeks, and Japanese define it – or of a Palestinian nation for that matter. 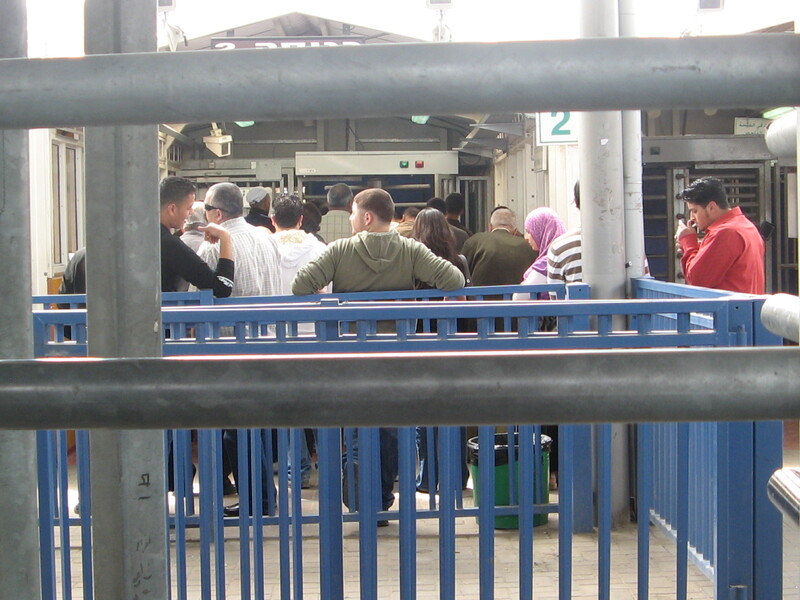 If anything, Zionism is more open and inclusionary than Palestinian nationalism, as anyone can become a Jew if he or she really wants to and thereby automatically obtain Israeli nationality, whereas to be Palestinian is to be Arab and born of Palestinian parents (and specifically a Palestinian father). Ethnic, jus sanguinis-based nationalisms unfortunately predominate in today’s world and will be with us for a while to come. Secondly, Judt is way off the mark in seeing some kind of inevitability, not to mention desirability, in a binational state. Such a state, where Jews and Palestinians live together in harmony, is certainly a beautiful idea but the problem is that practically no one in Israel-Palestine wants this, has ever wanted it, or will likely want it in the future. And least of all the Palestinians, who are absolutely fed up with being ruled by Jews and want them out of their lives. 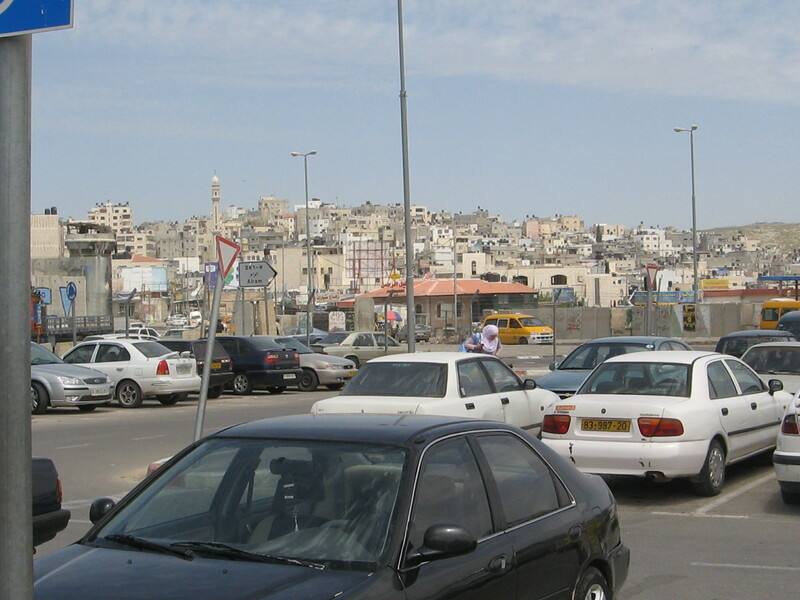 Palestinians want their own state, not one where Jews will continue to run the show (which would almost certainly be the case – economically at least – in a binational setup even if Jews were only a third of the population). 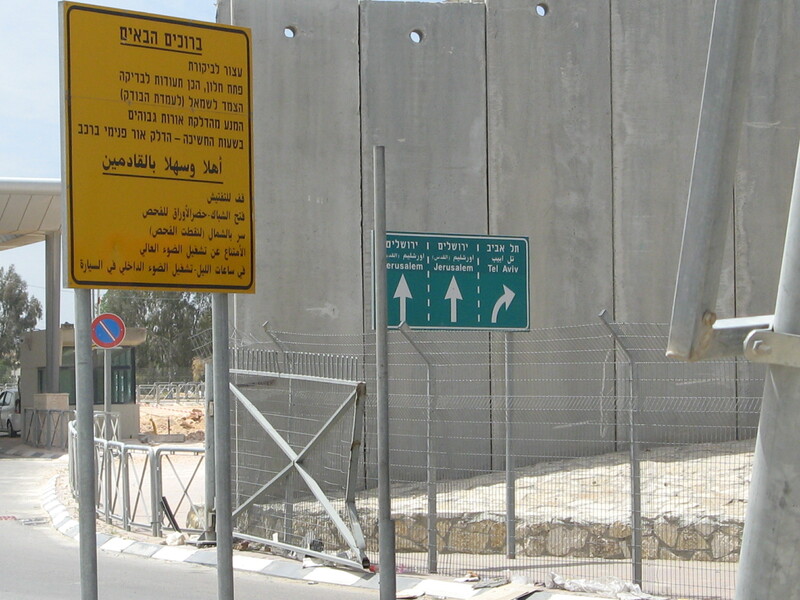 Israelis who invoke the specter of a binational state (Avraham Burg, Meron Benvinisti, etc) do so out of despair, not conviction that this is at all a desirable solution. Those who advocate a binational state also never hint at how such a thing could possibly be made to work, what its institutions would be, or how it would even come into being in view of the mutual antipathy of the two nations destined to coexist in the new entity. 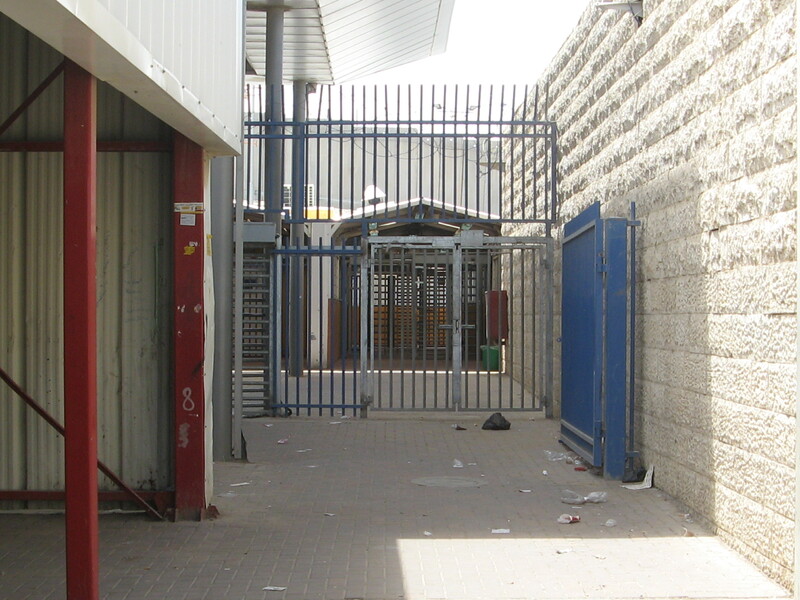 Does anyone seriously imagine that the Israeli and Palestinian electorates – whose mutual loathing will only increase in the foreseeable future – would ever endorse such an arrangement in a referendum? With all due respect to Judt it’s a half-baked idea and which bears no relationship to the reality on the ground in Israel-Palestine. 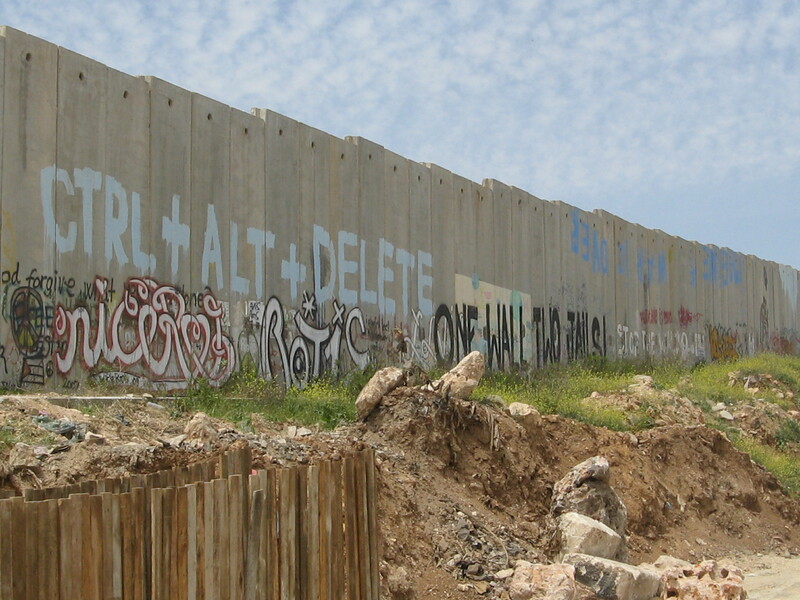 Which gets to my third disagreement, which is Judt’s assertion that the two-state solution is probably dead. 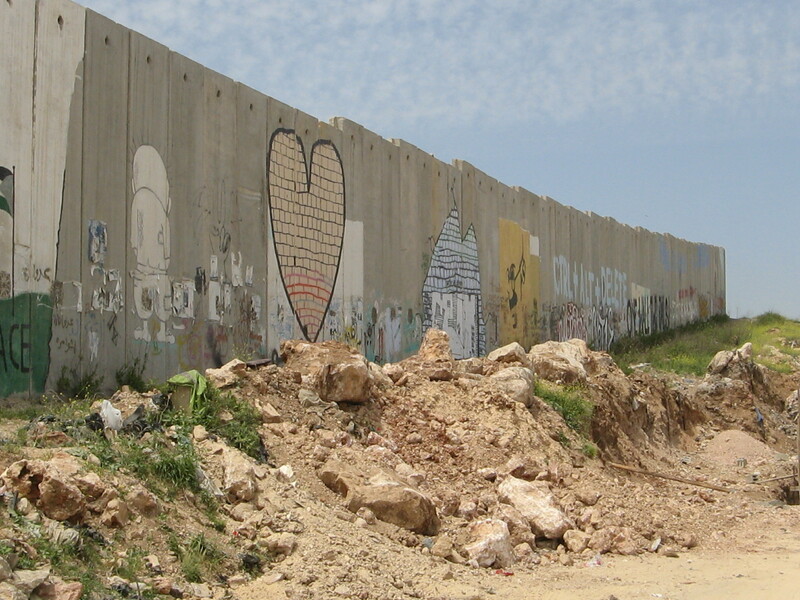 Israel can settle as many Jews as it likes beyond the Green Line and build walls as high as the sky but the rest of the world will never accord this legitimacy. 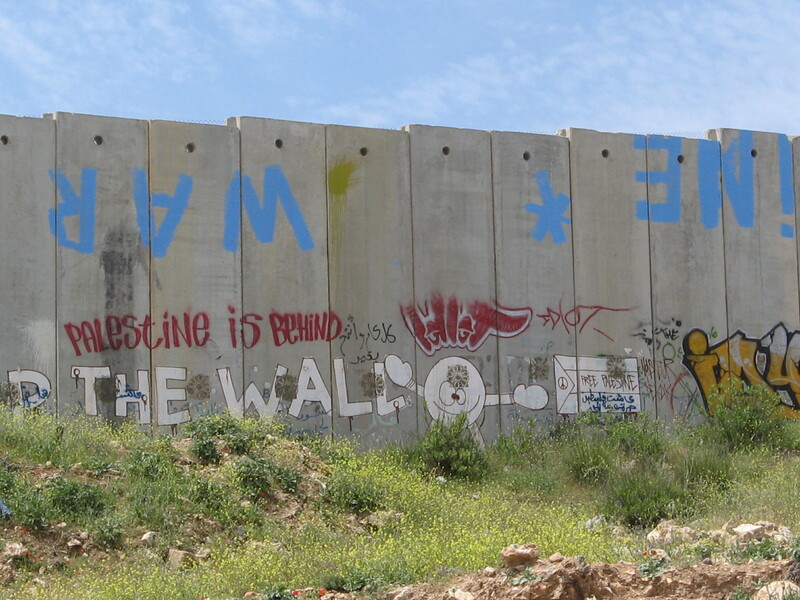 And, needless to say, no legitimate Palestinian leadership will ever accept it. If the present situation continues to fester – and there is no reason to believe it won’t – it will sooner or later destabilize the region and negatively impact on US interests, constraining the US to seriously reengage in the peace process and recover its status as an honest broker. As the Israelis and Palestinians seem incapable of arriving at a solution on their own, the only way out of the impasse, so far as I can see, is the one laid out recently by Hussein Agha and Robert Malley, which is for the US, EU, Russia, and ‘moderate’ Arab states to agree among themselves on a two-state final settlement – most certainly along the lines of the Clinton parameters of December 2000 – and oblige the Israeli government and Palestinian authority to submit it directly to their electorates in a referendum, where it would most certainly be ratified. Reading this eight years later I would modify the third point and drop the bit about Judt being brave—in writing the essay he wasn’t risking a thing apart from the eternal opprobrium of people like Martin Peretz—, but reinforce the arguments in the first two. 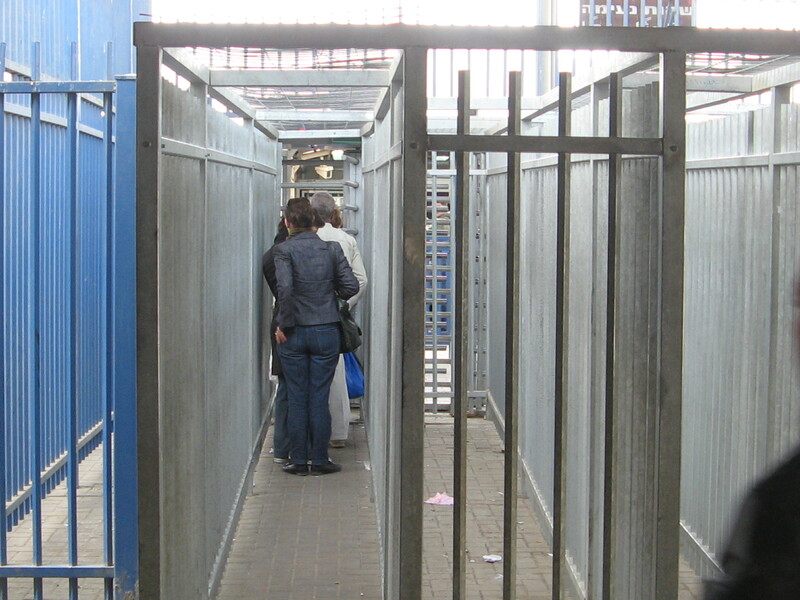 Israel has its particularities as a society—notably in the size of its religious population—but as a nation it is not an outlier even in the Western world. 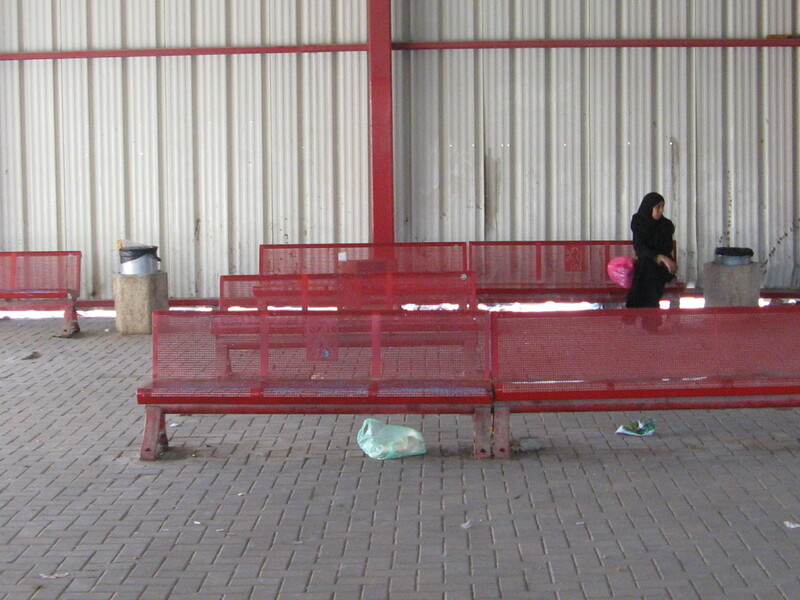 There is no contradiction between Israel defining itself as the state of a particular national group—the Jewish people, and with those in the diaspora having the right to claim citizenship—and of such being displayed in the symbols of the state (flag, national anthem, etc), while at the same time respecting the rights of national minorities, in this case the Arab citizens of Israel. On this, I am entirely persuaded by the arguments of Alexander Yakobson and Amnon Rubinstein on the issue. A number of Western democracies have situations analogous to that of Israel—of cross-border diasporas in the country and enjoying the status of national minorities—, e.g. 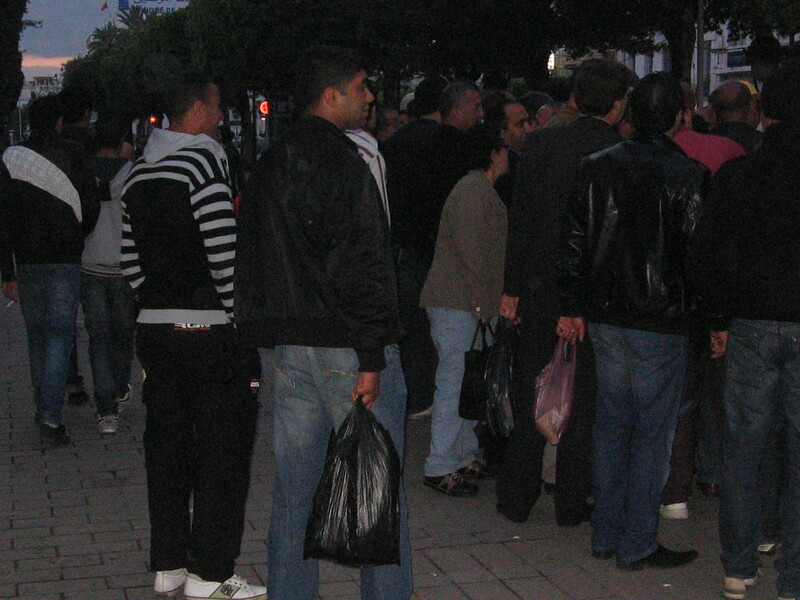 Hungarians in Romania (and also in Serbia and Slovakia), Turks and Albanians in Greece, Swedes in Finland, South Tyroleans in Italy… Israeli Arabs may be second-class citizens and suffer various forms of discrimination—which are not fatalities etched in the stone of the Israeli state, to mix my metaphors—but their cultural, religious, and linguistic rights have always been respected. And, it may be added, they are not discriminated against when it comes to political representation, i.e. given the way the Israeli electoral system works there are no institutional impediments to Israeli Arabs being represented in the Knesset in exact proportion to their demographic weight in the country. In general I don’t get into arguments or debates over the binational/one-state idea, as I think it is so cockamamie and off-the-wall that it is not worth discussing. There are, in fact, only two groups who advocate one state. The first is mainly comprised of Arabs, hard leftists, and sundry tiersmondistes, for whom the one-state idea is simply a euphemism for the elimination of the state of Israel. They reject the legitimacy of Israel’s existence, period. 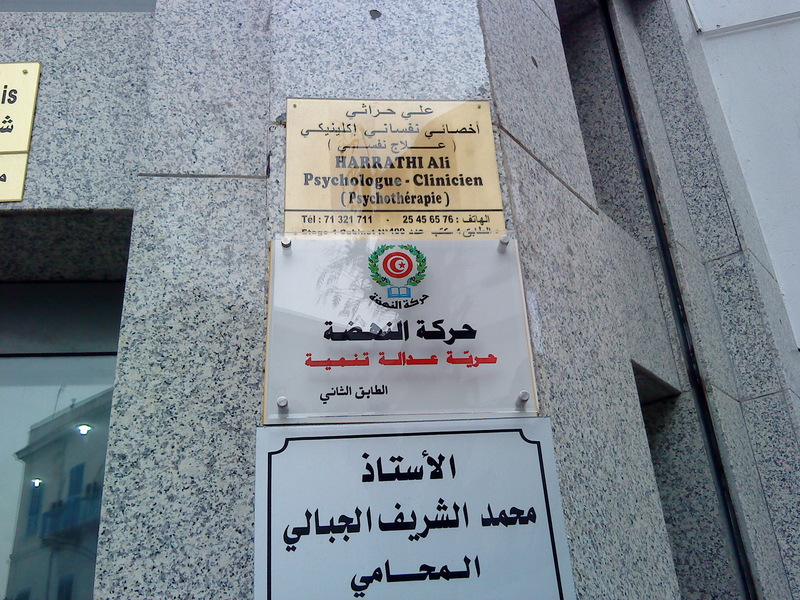 (For Arab perceptions on this, see my post on mental maps). And for some odd reason they seem to think that what the Palestinians failed to achieve by armed struggle can somehow be realized by boycotts and sanctions, court cases, letting demography do its handiwork, or whatever. The second group—and to which Judt belonged—is made up of dreamers and naifs, who have a faulty knowledge of the conflict and its history. When confronted with members of either group, I simply ask them to provide a credible scenario as to how the one-state could come about in the foreseeable future, i.e. before we’re all dead. If they can do this, then we can discuss the successes and failures of other binational states (e.g. Cyprus, Belgium, Canada/Quebec). If they can’t do this—and they in fact never do—, then I’m simply not going to get into the issue. I’m not going to waste time talking about pie-in-the-sky. There are a couple of points that need to be added. Those who advocate binationalism overlook one immutable fact. 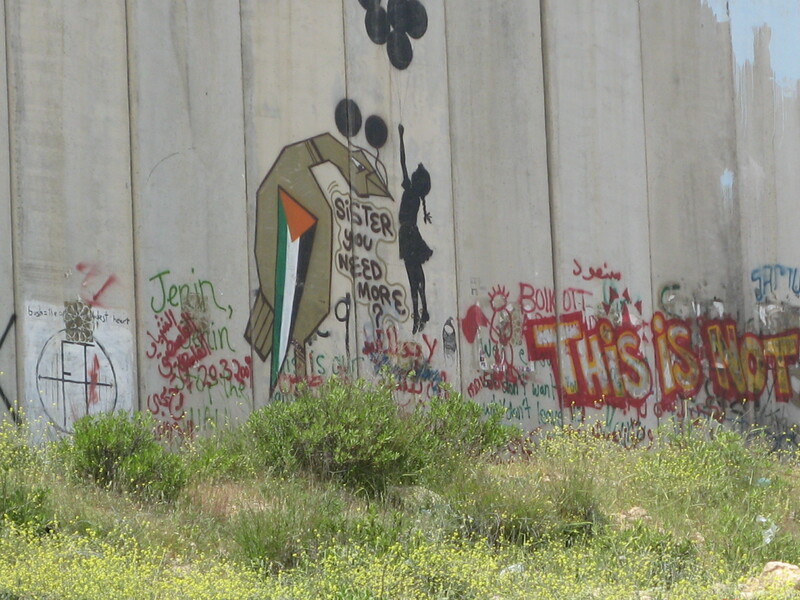 Binationalism means two nations—Jews and Palestinians—and the mutual recognition of such. Golda Meir may have denied the existence of a Palestinian people forty years ago but hardly anyone in Israel does today. The acknowledgment that Palestinians constitute a national group—or have a vocation to be one—is largely admitted even on the Israeli right. But such is decidedly not the case on the other side. 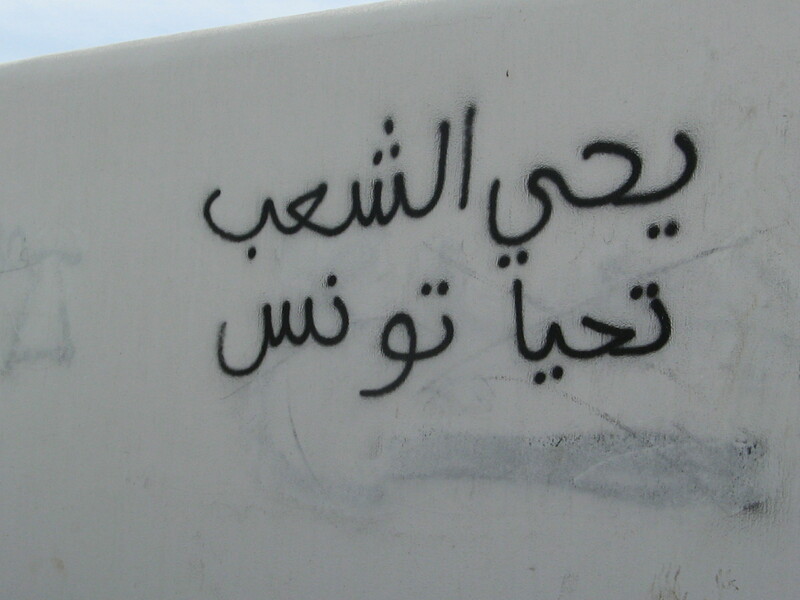 For Palestinians, Palestine is Arab and Palestinians are Arabs. Case closed. The Palestinian consensus on this is total. As for the Palestinian/Arab view of Jews, the latter is considered a religious community tout court. The notion that Jews may also constitute a national group—that Jews are a nation and with a vocation to have their own state—is vehemently rejected. It always has been and is to this day. Jews-as-a-nation is Zionism. And Palestinians will sooner go to Jonestown and drink Kool-Aid en masse than formally recognize Zionism and accord it legitimacy. 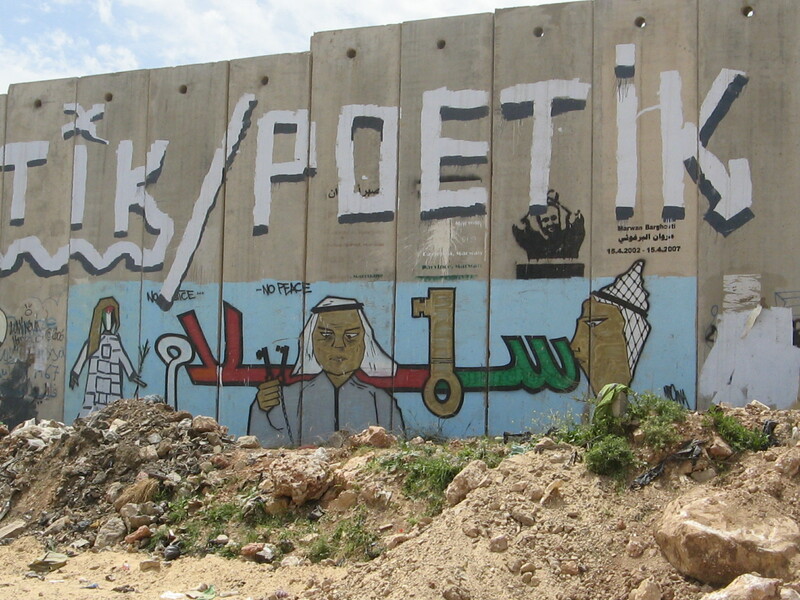 In this respect, it is to be noted that when Palestinians talk about one state, they never refer to it as binational. (Sure, Edward Said may have done so, but he was more of a deracinated American than a Palestinian). As for the third point—which needs modifying—, I do think a two-state solution based on the June 4th 1967 borders is still theoretically possible. More or less. 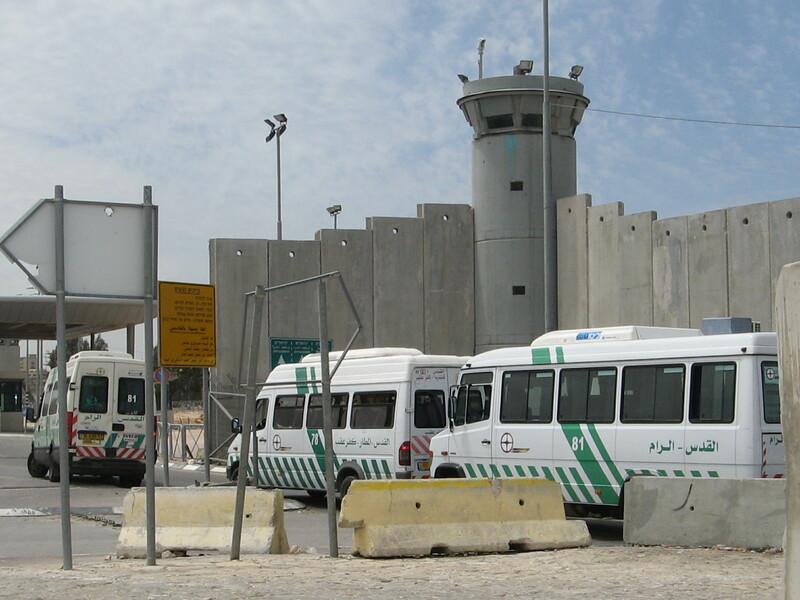 Palestinians do have a right to be free and not live under occupation. There are, in fact, creative alternatives to the standard two-state scenarios that have been laid out ad infinitum (Clinton parameters etc etc). I’ll get into this in detail at the opportune moment.